Swoon, Edline, 2016 wood, linoleum block print with hand painted acrylics on paper mounted to wood, paper cutouts Courtesy of the Artist and Chandran Gallery, San Francisco. James Jean, Bouquet, 2016 acrylic on canvas, Private Collection. 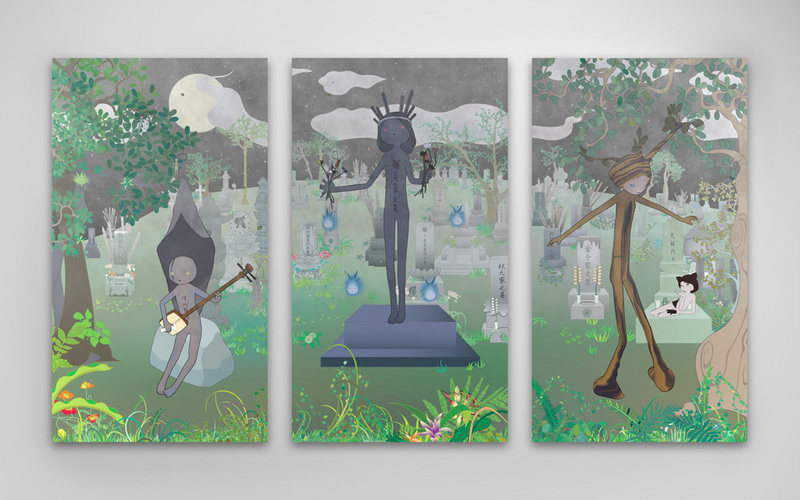 Chiho Aoshima, Little Miss Gravestone’s Absent Musing, 2016 interactive monitor, video animation © 2016 Chiho Aoshima/Kaikai Kiki Co., Ltd. All Rights Reserved. Marc Ryden, Anatomia, 2014 oil on canvas, Courtesy of the Artist and Paul Kasmin Gallery. Christian Rex van Minnen, Coat of Arms, 2016 oil on linen, Courtesy of Robischon Gallery. John Hathway, Magic Rocket Station, 2013 inkjet print on wood panel, Courtesy of Kaikai Kiki Gallery. For 20 years, Pricco has used his position as editor-in-chief at San Francisco–based magazine, Juxtapoz Art & Culture to celebrate the work of so-called “sub-cultural” artists. 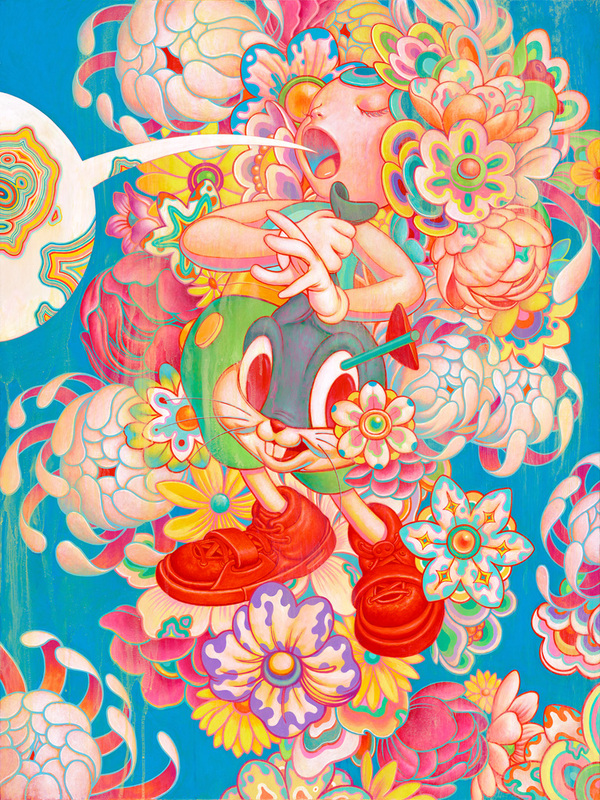 Along with Japanese artist Takashi Murakami, Pricco co-curated Juxtapoz x Superflat to emphasize boundary-pushing ceramics, paintings, sketches, and digital art pieces which represent how, he says, “people view and take in art in 2016.” The works from Juxtapoz x Superflat’s 36 artists reflect Juxtapoz’s influence on the development of contemporary art, as well as the fundaments of Murakami’s “superflat” art theory, a process in which popular culture breaks (or flattens) barriers between low and high art. 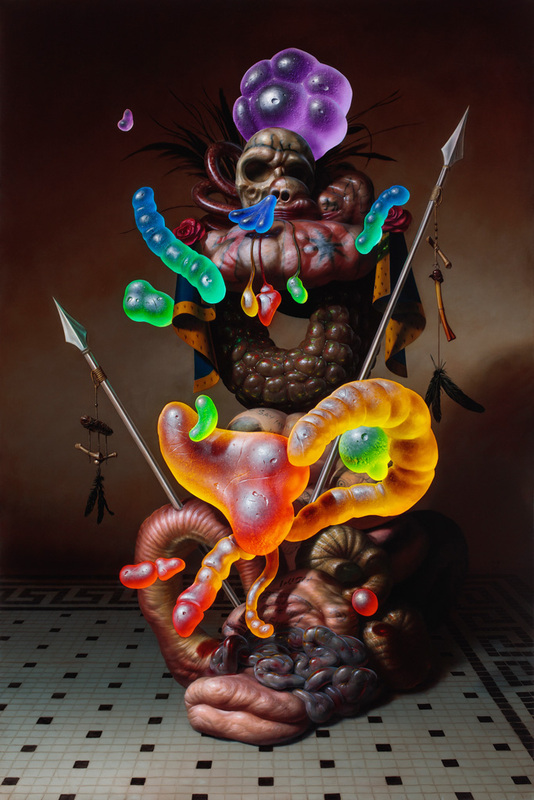 “The initial idea of this show came about in a conversation that myself, the artist James Jean, and Takashi Murakami were having in Tokyo about how the critical art world wasn’t looking at the movement that had been happening in the Juxtapoz universe over the last 20 years,” says Pricco. Namely, during that time, Picco observed artists emerging from unlikely places and creating work divergent from tradition. Take, for instance, street graffiti artist, Swoon (born Caledonia Dance Curry). In an era when graffiti culture was heavily male-dominated (often, it still is, Pricco adds) Swoon’s work stood out, garnering attention for its gentle imagery as distinct from the frequently chaotic spray paint murals popularized by urban male artists. Juxtapoz x Superflat features Swoon’s mural, Edline, which depicts vivid geometric patterns surrounding a solemn young girl, exemplifying Swoon’s different, and poignant, approach to street art. The exhibit also showcases artists whose work has not gathered mainstream traction, such as James Jean, the sketcher and painter with whom Pricco and Murakami conceptualized the exhibit. Although Jean boasts a half million followers on Instagram, and briskly sells prints through his personal website, he has never been formally recognized by professional art communities. With the inclusion of his whimsical and at times eerily elegant work, which incorporates imagery from manga and western pop culture, Jean’s style is now accessible to a new audience of gallery-goers. “This entire exhibit … isn’t a retrospective. It’s an appreciation for the contemporary energy happening in the art world,” says Pricco. Juxtapoz x Superflat, the Vancouver Art Gallery, 750 Hornby Street, from November 5, 2016 to February 5, 2017.